Botswana will celebrate 50 years of independence in 2016 and in that 50 years has grown to be one of the most exclusive safari destinations in Africa. Lovely small camps and lodges, often in private concessions where visitor numbers are restricted, result in a high quality safari experience. 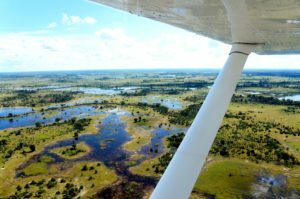 17% of Botswana’s land is given over to conservation while the jewel in Botswana’s crown, the Okavango Delta was last year declared the 1000th UNESCO World Heritage site. As many will have read, the world’s second largest diamond has just been discovered in Botswana – a whopper – at 1,111 carats, but in our opinion nothing sparkles brighter than Botswana’s beautiful landscape, home to a plethora of wildlife. 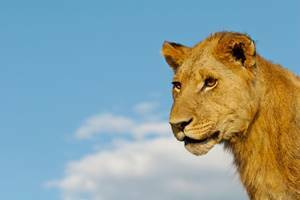 It is for these reasons that The Lonely Planet team, who describe Botswana as ‘wild Africa at its best’, have rated the country the number one place to visit in 2016. We couldn’t agree more! Here’s our guide to one of Africa’s most rewarding safari destinations. 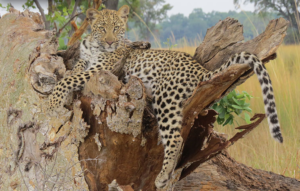 a fantastic array of wildlife to enjoy from the big cats of the Linyanti marshes and Chobe’s vast herds of elephants to the shy inhabitants of beautiful islands, channels and remote plains like the Sitatunga, Pel’s Fishing Owl and the rare Klipspringer antelope. the chance to combine the arid salt pans of the Kalahari Desert with the watery scape of the Okavango Delta – you can even throw in a stay at Victoria Falls in nearby Zimbabwe, making for a superb safari holiday. What’s more, you don’t have to wrestle with time change since Botswana is only 2 hours ahead of GMT and also has a reputation for being the ‘safest country’ in Africa with little poaching or corruption. Did you know? Pula is the name of the national currency but also the Setswana word for rain. The peak season is between June and September, characterised by dry and warm days in the twenties with cold nights. Booking early is imperative as the small camps and lodges fill up quickly at this time of the year. The low or green season is between November and March, characterised by hot steamy weather by day and night, and sudden afternoon downpours. This is the time to take advantage of great deals and special offers and is the best time to see the desert salt pans which spring into life as game tracks south from the Delta. The shoulder months of October and April/May are transition months with the weather changeable. October is the hottest month, but you’ll be rewarded with vast herds gathering around the last bodies of water. April is generally quiet in the parks and reserves and can be stormy. 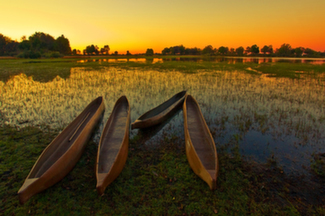 The Okavango Delta starts to flood in May time, allowing for mokoro journeys and boat safaris from many of the camps. As the winter progresses, there is less vegetation and less water, with September and October often hailed as the big herd months, when animals gather in great numbers around the remaining water sources. Water levels can become perilously low in October in some areas, with boat safari activities sometimes suspended in extreme cases like in 2015. This may impact on your choice of camps and may not be the best time of year to combine Botswana with Victoria Falls which can be reduced to a trickle by November. We try and recommend camps on deep water channels at this time of year subject to availability. There are few mosquitoes during the dry season and you can expects beautiful, clear days. The scenery is at its most lush and beautiful – great for photography. This is the best time to see migrant birds and young animals are often born at this time of year. It is the optimum time to visit the pans (the desert area) which springs into life with green shoots on the dunes, courting giraffe displays and zebra and antelope arriving followed by the big predators. January and February tend to be the wettest months and October and November the hottest. There are excellent offers and low season rates available throughout the Green season – look at for Kwando’s Five Rivers offer usually out in January time annually. Find out about Five Rivers here. Daytime temperatures hover around the low twenties in the Delta – most downpours arrive in the afternoon having little impact on your safari day with the exception of January and February when rain can be more persistent. There are currently no direct flights to Botswana – the vast majority of our clients fly direct to Johannesburg in South Africa, from where there are good reliable connections with SA Airlink on to Maun or Kasane. You can also fly into Maun direct from Harare, Cape Town and Namibia. The national carrier Air Botswana runs scheduled flights. Many people choose to combine a safari in Chobe, Botswana with Victoria Falls, Zimbabwe, only a few hour’s drive away – there is a fine tarred road from the Falls to Kasane, and then once over the border it generally takes around half an hour to the riverfront area making a drive of around 3 hours in all, (depending where you are staying – the Chobe Forest Reserve is a bit further away). The opening of the new Victoria Falls airport in late 2015/early 2016 will no doubt open up many more opportunities for safari combinations in this region. All the major gateways are linked by air, while the private flight charter network is well developed. 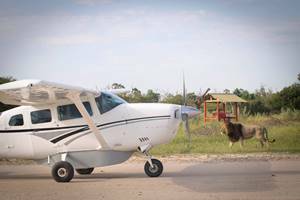 Because of Botswana’s geography it is usual to fly-in to your lodge/camp by light aircraft. Chobe is the exception. Luggage is restricted on light aircraft to a single piece of soft luggage weighing no more than 20kg. Camps include your laundry in their nightly rate so this is manageable for most but for those away for a long time, excess luggage can be left in Maun or Johannesburg. A trip to Botswana is all about getting into the wilderness. This is a place where experiential travel excels. From canoeing the remote waters of the Selinda Spillway and camping on deserted islands, or paddling a traditional mokoro (dug out canoe) to staying in utter luxury and enjoying safari on foot, by boat and by 4WD (by day and night), Botswana really does have it all. The Okavango Delta is an iconic landscape, one of the world’s largest inland deltas, where the waters ebb and flow. Rain falling in the distant mountains of Angola, reach the Delta in May/June time, flooding it and changing the landscape, only to be absorbed by the greedy salt pans further south. The Delta can be split into three key areas: private concessions, the Moremi Game Reserve and the Zambezi Region. This area is so special it was declared the 1000th UNESCO World Heritage site in 2014. The Okavango Delta covers more than 15,000 square kilometres. 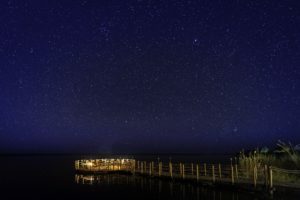 Wonderful private concessions including Chitabe, Kwara, Shinde, Duba Plains and Jao help to protect wildlife and keep down visitor numbers, while the eastern edge of the Delta is safe guarded by the Moremi Game Reserve (see below). The western side which flows to Namibia is known as the Panhandle, Caprivi Strip or Zambezi Region. Experiences will be different in each area – we recommend six nights on safari in the Delta area itself, allowing you to combine two or three contrasting camps and locations. While the camps in private concessions within the Okavango Delta offer incredibly high standards and low visitor numbers, their real calling card is that guests can enjoy a variety of activities including off road driving, night drives and walking – activities not offered by camps in the Moremi Game Reserve. Land-based 4WD safaris will be largely focussed on seeing the big predators like lions, wild dog, leopard and cheetah, while the water based safaris bring you up close to the magnificent bird life of the Delta and some of the rarer and shyer Delta dwellers. You’ll find a range of habitats and a network of channels interspersed with islands. Shallow reed beds, swamps, floodplains and forests are home to a huge variety of sepctacular wildlife, from the endangered red lechwe and wild dogs to elephant, lion and hippo. There are around 122 species of mammals, 71 species of fish, 444 species of birds, 64 species of reptiles and 1300 species of flowering plant in this region. If you’re really lucky you may see all the Big Five – lion, leopard, elephant and buffalo are all present while a rhino reintroduction programme in the Okavango now puts the population of White Rhino at approximately 35, and Black Rhino at 4 (and growing thanks to the Great Plains / AndBeyond Rhinos Without Borders relocation). Moremi Game Reserve is the protected eastern portion of the Okavango Delta. It has been a national reserve since 1963 and covers approximately one third of the Delta (around 5000 sq km). Moremi’s main landmark is the 70km long Chief’s Island, historically the hunting ground for the local chief. Today, Chief’s Island is a wildlife haven with much of the Delta’s wildlife retreating here as the water level rises. It’s prime Big Five territory once more following a successful rhino reintroduction programme. In addition, Moremi harbours the largest population of red lechwe, protects African wild dogs. and is the best place to see Pel’s Fishing Owl. Another place of note within Moremi is the Xakanaxa Lagoon, home to a heronry. The Zambezi Region, once known as the Caprivi Strip, is a narrow strip of swamp that extends to the Namibian border. You’ll find permanent waterways, vast reed beds and calm lagoons perfect for fishing and bird watching. Big game is harder to see. Chobe has been a National Park since 1968 covering 11,700 sq km. It can be split into three key areas: Savuti, Linyanti and the Chobe riverfront. 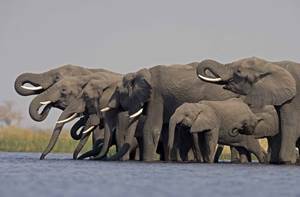 Chobe comes into its own during the dry season when vast numbers of game congregate around the water sources – the Chobe River and the Linyanti River. Concentrations are truly spectacular as the dry season marches on. Wildlife to be encountered includes waterbuck, lechwe, puku (this is the only part of Botswana where they can be seen), giraffe, kudu, roan and sable, impala, warthog, bushbuck, monkeys and baboons, along with the accompanying predators of course from lion and leopard to hyena and jackal. Chobe also has the densest concentration of elephant in the world – some 120,000. A river cruise is a great way to appreciate the spectacle. In addition, over 460 bird species have been recorded in the park, making it one of Africa’s premier birding destinations. Seeing Pel’s Fishing Owl is a highlight, while most members of the kingfisher family, carmine bee eaters, rollers and raptors can all be admired. Savute is a region of Chobe. The Savuti channel is one of Africa’s great mysteries, a truly remote and wild place. The channel has a long history of drying up for many years and then miraculously flowing again – possibly due to tectonic activity in the region but largely unexplained! The word Savute means ‘unpredictable’ and refers to the region, while Savuti refers to the channel itself but it is common to see both spellings. The channel itself stretches for 100km, leading from the Linyanti River to the Savute Marsh. Following a a period of heightened rains in 2008, the Savuti channel started to flow, deep and blue, once again, eventually flooding the Savute Marsh in 2010. Before that, the channel had not flowed since 1982! In the past, the main features of the area were the ghostly dead camelthorn trees rising above th edry plains but now areas of flat marsh and woodland habitat are home to herds of buffalo and elephant moving in from the south-west of Chobe, with wildlife concentrations improving year on year while the channel is flooded. There are no rhino here yet but plenty of birdlife, plains game and the annual migration of zebra ensures a trail of lion, leopard and cheetah. Zebra migrate in December and February time, depending on the rains. They move from the rivers in the north to the lush new grass in the south. The rare Klipspringer antelope can also be seen in this region, along with San Bushmen rock art in the 980 million year old Gubatsa Hills which rise 90m above the plains. Linyanti is the region in the northwest of Chobe, home to the private Kwando/Linyanti and Selinda concessions. 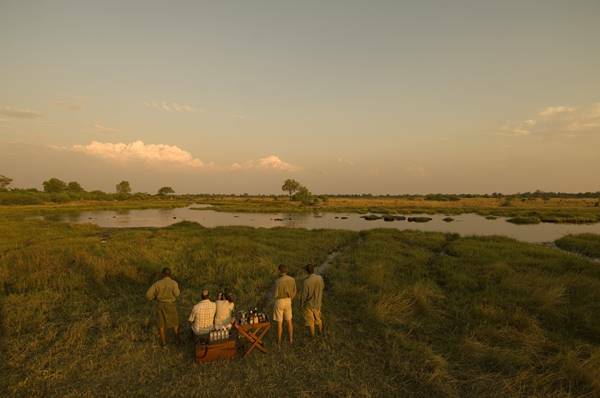 The area is game rich, bordered by the Okavango Delta to the south. The permanent waterway, the Kwando River, ensures that game is excellent throughout the dry season. Being private, activities sych as walking, night drives and off roading are possible. Kwando Linyanti is home to five camps – Lagoon and Lebala camp in the Kwando portion and Duma Tau, Kings Pool and Savuti Camp in the Linyanti concession while the Selinda concession, which protects the famous Selinda Spillway is home to Zarafa, Selinda Camp and Motswiri Camp. The area is a mix of lagoons and marshes along the Kwando-Linyanti Riverfront with drier mopane forest beyond. Lions are abundant and wild dogs den in the area. For seeing the big predators this area is simply fabulous. Easily accessible from Kasane by road, everybody wants to be on the northern boundary where the Chobe River flows and as such it attracts a high density of traffic from day trippers and self drivers to lodge vehicles. 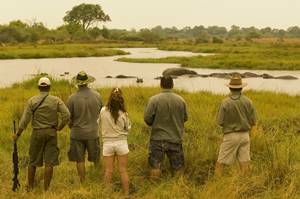 The Chobe Game Lodge is just a half hour drive from Kasane, and with a plum location right on the river, is hard to beat for those wishing to stay in the heart of the action. The density of game during the dry season here, peaking September/October time, is impressive. Small safari motor boats ply the river dodging hippos, while huge herds of elephant and buffalo gather on the banks. You also have a good chance of seeing lion and even leopard. Heading further west to the Forest Reserve, away from the bustle of Kasane, is a good alternative. Here, lodges like Muchenje, enjoy commanding views from an escarpment looking over the Chobe River beyond. Game densities may be lower beyond the riverfront but rarer species are evident such as Roan and Sable and there is considerably less bustle. The desert region is made up of Kgalagadi, for the Kalahari and the Makgadikgadi for the famous salt pans. 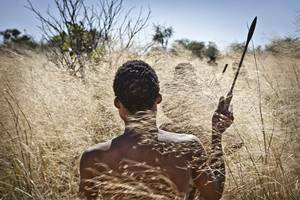 The CKGR was off limits to tourists for around three decades as the reserve was to be a place for the San Bushmen to live their traditional life. The government is now allowing restricted development for a few lodges in the hope of developing tourism in this fascinating area where you can see some of the world’s oldest rock art, witness the ancient migration path of thousands of wildebeest and zebra and experience the true meaning of isolation. Deception Valley is one of the highlights, coming to life after the rains with lush sweet grass shooting and grazers coming from miles around. 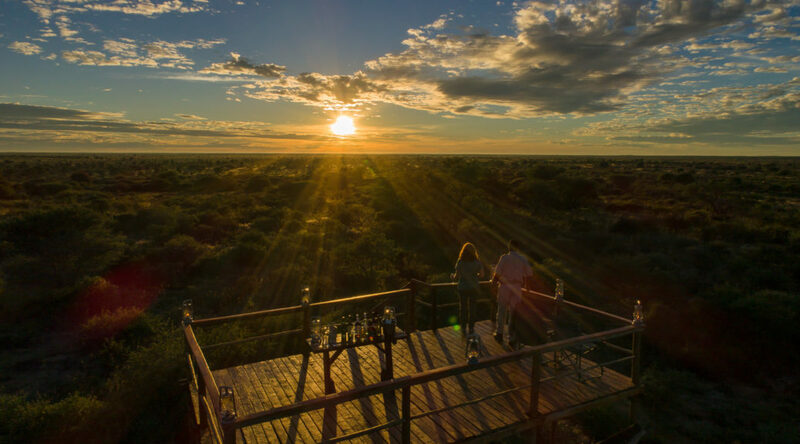 There are only two permanent camps actually within the reserve – Kalahari Plains and Tau Pan. Makgadikgadi covers an area of around 12 000 sq kms, and is part of the Kalahari Basin. It is one of the largest salt pans in the world. Actually the area comprises a whole series of salt pans – from Sowa, the largest, to Nxai Pan, the most accessible. The area has a stark beauty, which David Livingstone experienced during his explorations of the 19th century, guided by one special landmark: Chapman’s Baobab . The baobab tree is possibly 4000 years old and one of the only things to punctuate the endless blue horizon. The salt pans shimmer in this arid landscape, with clouds of dust blurring the horizon, before the landscape is entirely transformed; the salt pans become shallow powdery blue lakes during the summer rains, flamingos arrive, and grass and other vegetation shoots, attracting animals from miles around to feast on the lush new shoots. Nxai Pan itself is a 2578 sq km national park with, as you may expect, two distinct seasons – wet and dry. During the green summer season, large herds of animals track from the south followed by predators and flowers bloom on the dunes making this an exciting time to be in the area. 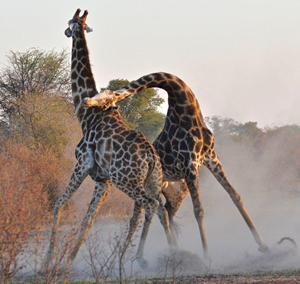 If you visit is timed to perfection you may observe giraffes as they start courting. 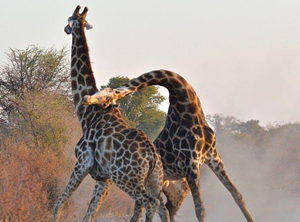 The males engage in a ferocious battle for dominance called ‘necking’ . During the summer, there are also good cheetah numbers. Baines Baobabs are in the south . The scene is largely unchanged since the baobabs were painted by Thomas Baines in 1862. The UNESCO World Heritage Tsodilo Hills are nicknamed the ‘Louvre of the Desert’ for good reason. Four hills, the highest at 1400m, have huge spiritual significance for the San Bushmen in north west Kalahari with stunning displays of ancient rock art. Explore some sample itineraries with guide pricing here. Check out some of our favourite lodges in Botswana. We have a dedicated Botswana, Zimbabwe, Zambia brochure now out – request yours here. 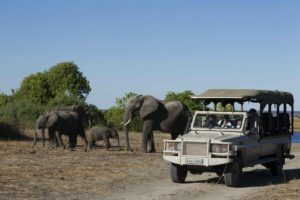 Classic Botswana – a safari holiday that gives you time to enjoy the iconic Victoria Falls as well as game drives in Chobe National Park, Botswana, famous for its elephants. 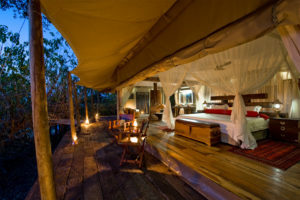 Into the Okavango – a private safari to 3 diverse habitats in the world-famous Okavango Delta. Staying at Ker & Downey Camps – Camp Okuti, Kanana Camp and Shinde. Desert & Delta – a fabulous fly-in safari combining camps in three areas, including the famous Savute region. 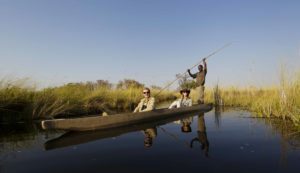 Ultimate Botswana – the ultimate safari to Botswana; exploring the Okavango Delta and the Selinda Spillway and staying in some of the finest luxury camps in Africa. What is the Green Season in Botswana? 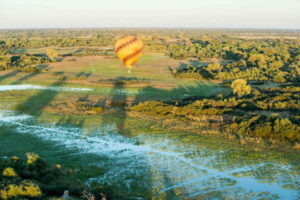 The Green Season is essentially the very apt name for the warm, wet summer months in Botswana. The Green Season runs from November through to April. It is the time of year when the country gets most of its annual rainfall and the countryside becomes green and lush. Now most people worry when they hear the word “rain” in the same sentence as “holiday” but the Green Season is actually an excellent time of year to explore Botswana. The rainfall tends to be concentrated around February so if you travel from November to January you will probably miss the worst of the rain and even in February and March its not that bad! The annual rainfall in the Okavango is no more than in London only it is concentrated into a few months instead of all year round like here in the UK. The rain tends to come in short, heavy downpours, usually in the afternoons when the heat has built up into thunderstorms. However they don’t occur every day and you can enjoy beautiful sunny days in between. There are many benefits to travelling in the Green Season, the main one being that there are substantial discounts. 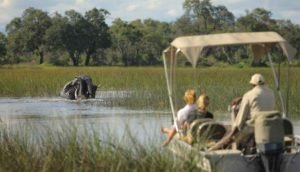 Botswana’s main tourist season coincides with the European and American summer holidays so it can get booked up early on. During the Green Season it is much quieter and the camps and lodges offer good discounts. The other advantage is that you will pretty much have the place to yourselves as the visitor numbers are so much lower. For those who really want to get away from it all you can enjoy the remoteness of the African bush without seeing another person whilst out on a game drive at this time of year. Another huge benefit of travelling in Green Season is that the countryside becomes stunningly beautiful and lush. Vast arid salt pans becomes wetlands teeming with birdlife and the dusty plains become vast meadows of lush green grass and beautiful wildflowers. The trees are also green and heavily canopied, providing cool shade and a verdant backdrop to the wildlife. Botswana is a photographer’s paradise and no more so than during the Green Season when the dusty air becomes much clearer, views become sharper and colours more vibrant. The scenery is truly spectacular during the green season and the landscape comes alive with the vast numbers of birds and animals that live here. And of course, the lush greenery brings out vast herds of herbivores and where they go so too do the predators. Many animals migrate during the Green Season including a mass migration of zebra across the Kalahari and the Savuti. 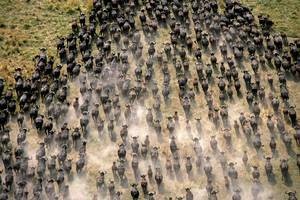 Elephants and wildebeest, buffalo and antelope are all on the move in large herds at this time and it is also the time when they produce their offspring with plenty of food and cover all around. With all the animals on the move and weak youngsters to prey on the big cats are having a field day and can usually be found looking healthy and extremely well-fed! Botswana is also a birder’s paradise with a large number of migrant birds arriving from Europe during the Green Season as well as the local birds which include rare eagles, owls, kingfishers and waterfowl of every description. Escape the British winter next year and enjoy seeing Botswana’s beautiful Green Season with our Five Rivers Special! Botswana is one of those places you’ve heard of but you might be hard pushed to point out on a map. This beautiful and peaceful country is to be found down in Southern Africa and it is nestled in between South Africa,Zambia, Namibia and Zimbabwe. This place is huge. It is twice as big as the UK but only has a just under 2 million inhabitants. The vast majority of the country is undeveloped wilderness under a hue African sky. This makes is a great sanctuary for wildlife and therefore an absolutely fantastic safari destination. 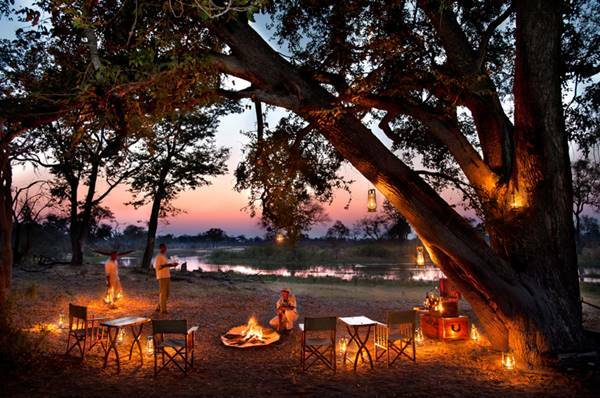 When you stay in a safari lodge or safari camp in Botswana you really are getting away from it all. You and the handful of other guests will be hundreds of miles away from city lights, noise and pollution. Nothing but you and the stars and the wildlife. 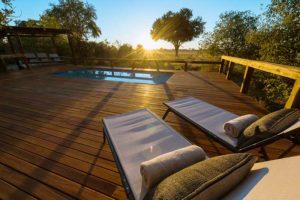 The lodges and camps on offer in the Okavango, the Moremi Game Reserve or the Chobe National Park range from simple eco-friendly camps up to total luxury and most tend to be small, intimate affairs with a small environmental footprint. Botswana is most famous for the unique natural phenomenon which is the Okavango River Delta. It is the only river in the world that does not flow into the sea. Instead the river flows down from Angolaand the water pools in the large flat depressions found across Botswana. These create large areas of marshes and wetlands intercut by lakes and rivers, creeks and lagoons during the wet season. This enormous area of wetlands is a wildlife haven and offers fantastic wildlife experiences. You can travel across the wetlands and down the channels by “mokoro”, which is the traditional canoe hollowed out of the trunk of a single tree. Don’t worry you wont be expected to master this yourself but you will be accompanied by an expert guide who can paddle you through the waters. If you are a bird watcher then the Okavango is an dream destination as this is one of the best places in the world for bird watching. Another natural spectacle not to be missed are the incredible salt pans. During the dry season some of the depressions completely dry out and transform the landscape. They form enormous salt pans creating barren white deserts which stretch across the horizon as far as the eye can see. At Makgadikgadi there is a network of enormous salt pans which cover an area of approximately 16,000 kms sq. which is the second largest in the world after the Bolivian salt pan at Salar de Uyuni. The main area for safaris in the North East of the country is the Chobe National Park. This is another extremely large area of African bush and a total wilderness. 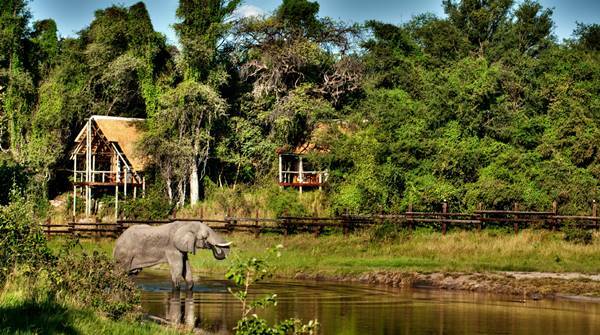 It offers great game viewing as it is lush and green during the rainy season unlike the neighbouring Kalahari Desert. The Chobe River is the area’s lifeline and it is also home to many hippos and elephants along its banks. It is also great for viewing predators such as the big cats and crocodiles along with huge varieties of antelope and other herbivores which roam the grasslands en masse. For a true chance to experience the African bush up close and personal nothing beats a walking safari. Many camps offer walks out into the bush and it is something that can be done as part of an organised trip with a professional guide. 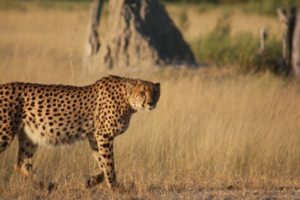 Setting off on your own for a trip into the African bush would be extremely dangerous but guided walks are an excellent way of exploring the stunning scenery and getting up close to some of the less predatory animals in the African savannah! Walking through the bush with nothing but the sound of your breathing is a completely different experience to the normal game drive. All your senses are heightened and every sound and every movement becomes momentous. The best way of really getting the most out of a trip like this is to book a specialised walking safari where walking is part of the daily itinerary and the majority of game viewing is done on foot. In Zambia the Luangwa National Park is widely said to be the birthplace of the walking safari. The area around the Luangwa River with its oxbow lagoons and islands is home to a fantastic concentration of wildlife. One of the stalwarts of the original walking safari Robin Pope has been leading walking safaris in this area for over twenty years. He has built up an expert team of guides who continue on his work and an expert guide is essential! The walking guide will enable you to get the most out of your experience. He or she will be able to identify the animals, birds and plants around you. They will teach you to use your senses and to look for tracks and clues that are around you in the bush. You will learn a huge amount about the flora and fauna of the Africa bush and about the natural environment – so much so that you really will take home a much better understanding of the African world. Walking safaris also offer you other opportunities. If for example you are a keen photographer or bird watcher these trips allow you many possibilities you may not otherwise encounter to get really close to your subject. Another variant on a walking safari is the mobile camp safari. With these kind of holidays you walk every day from one place to another exploring the bush while a back-up team carries all the tents and camping kit to your overnight campsite and gets the camp ready for your arrival. These are great fun and they give you the chance to really visit some remote places that are not accessible by car in wonderfully unspoilt and undiscovered scenery. Another fun option is to take on the popular night-time safari walking tours that some camps and lodges offer. Again these are limited to certain areas where it is safe to do so and are done only with expert guides in charge. They give you a unique opportunity to witness the nocturnal goings on around your camp that you would normally miss out on. You can do guided walks and walking safaris in South Africa, Botswana, Namibia, Kenya and Tanzania.